Okay, I’ll admit it. There is no such thing as a mirrorless war. The title might be a bit much. But the buzz around Canon and Nikon entering the full frame mirrorless market couldn’t be bigger at the moment. Here is my view on the topic. Please excuse me for this article being quite a long read. I want to point out that this is my personal opinion and not intended to hurt anyones feelings (We all know fanboys can get easily excited.). Why the mirrorless war doesn’t exist. Here’s the thing. With Canon and Nikon two of the mayor players in the photography business entered the full frame mirrorless market not only very late, but almost at the same time. I’m quite sure that the fact their launch events were so close together gave them even more attention in the end. At the same time the expectations were almost certainly too high not to be disappointed. While excitement definitely creates a lot of buzz around a brand, disappointment creates a lot more. With social media and the elusive rise of so called influencers, all of the buzz around a topic in the photography world gets soaked in and amplified. Go on youtube.com, type in ‘Canon Eos R’ and I guarantee you that the first 20 Videos in that search results will be from people who do not much else but “review” new cameras. While it’s perfectly fine to write or vlog reviews about new equipment, you do have to understand that those youtubers or influencers – or whatever you want to call them – do have an interest in escalating things. It’s like a reality show: There has to be something new with every episode. Sony was yesterday, the Canon Eos R and Nikon Z are today, but rumor has it that Canon is already working on two new APS-C Eos M and a more Pro oriented Version of the Eos R – does that sound familiar? If we take a moment and step back from all the heated arguments two things appear on the horizon: First of all cameras still work the same way and second, people may burn their nikes but not their nikons (I couldn’t resist that one). Personally, I don’t think those new mirrorless models were meant to break any sales records. Canon and Nikon created their first full frame mirrorless bodies for the sole purpose of getting into that market without killing off their DSLR lines in the process. Sure, they might not overtake Sonys mirrorless market lead, but looking at the numbers of the whole photography market that isn’t even necessary. You can’t talk about a war in an industry where the two biggest players aren’t even close to go all in. The ugly truth about the camera market is that sales are going down quite dramatically. We’re not talking about a few cameras. We’re talking about a percental decline in camera sales in the double digit area compared to the years before. That’s hundreds of thousands of camera bodies! At the same time there is this incredible spirit of optimism in the industry when it comes to technological developments on the camera market. How does that fit together? Well, here’s the thing: Reach into your pockets and take out your phone and you have found the reason. The smartphone is the new DSLR – at least for the casual user. Even photographers have to admit that smartphone cameras take pretty decent photos and they are always available. There’s no need for an extra bag, they are right there in your pocket. As every other technology market, the camera market might try to win the enthusiasts hearts and pockets but the real money is made with the consumer. All those entry level Canon and Nikon DSLRs that a camera enthusiast wouldn’t touch have been flying of the shelves in the past. All the mums and dads, aunties and uncles who traded their old 35mm pocket cameras for a cheap point and shoot digital camera eventually found out about the huge benefits in image quality that a DSLR could offer them and bought one. Most of them probably never used their DSLRs outside the Auto Mode but they were still satisfied with their purchase. Around the same time Smartphones with decent Cameras appeared and slowly but surely those DSLRs stayed on the shelve. Like every other technology, camera technology advances – more megapixel, faster autofocus, you take a pick. That leads the consumer to the moment when an upgrade seems inevitable. But in that case the consumer has already upgraded. Instead of buying a new DSLR the consumer does already own a shiny new smartphone that fits his or her needs much better than that bulky DSLR. With mum and dad enjoying their new smartphones the photo industry had to look elsewhere. One buzzword you might have heard a lot of are emerging markets and that’s where a lot of the camera manufacturers attention goes these days. These markets are in Asia and parts of Africa. Where people start to earn more money than they need for their daily life. Fujifilm sold a lot more Fuji X-As than any other model they introduced lately. They don’t go to the western market though. Those cameras are focussed on the emerging asian market, where people want that sweet image quality of a DSLR but can’t afford the camera manufacturers top models. Likewise, the Canon Eos M line has been seen as a cheap excuse by Canon not cannibalising their DSLR line. But those cameras sell actually pretty well. They don’t offer pro features obviously, but are still affordable for people who couldn’t afford a digital camera a few years ago. At the same time, more people then ever are interested in the mid to high end camera range. With the popularity of social media, more and more people want to start their own channels and find out that a smartphone as a recording device doesn’t suffice. This is the point where DSLRs come into the picture once more. Looking at the spec sheets of most recently released cameras, it seems as if video capabilities are equally important to the costumers as the stills image quality. 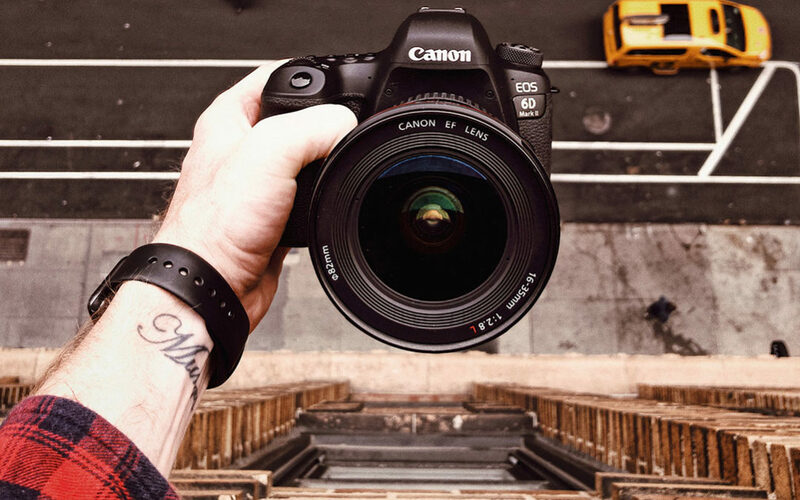 That brings us back to our famous youtubers and instagramers: They are the ones aspiring photographers or videographers look up to and the gear they use is of special interest for them. In the end it must play a part in their success story, right? The problem is, that most of them are somehow affiliated with the camera manufacturers or “brand ambassadors” – how they often call it. They get gear for free or with a generous discount and even pre-production models are handed out to them. The pinnacle are special launch events where these influencers are flown in from all over the world to test new camera models. These events are professionally orchestrated to gain the favour of those who come to enjoy them: helicopter rides, buggy races through the desert and a whole band of actors, dancers and models are in place to allow influencers to test the new camera in any given environment. The idea is clear. By controlling the environment those influencers test your new camera in, you control the overall look of the images that they share to the masses on social media. Welcome aboard the hype train! This focus on gear in social media leads to two dramatic shifts. People who would have been happy with their entry level gear feel the need to upgrade to the gear their favourite youtuber uses to achieve similar results. This leads to more people buying the more expensive mid to high end models and therefor increased profit for the camera manufacturers. On the other hand all the buzz around camera brands leads to consumers being more brand aware. Brand loyalty is the buzz word. Look at a photography news site of your choosing. Pick an article about a new camera and read the first few comments and you will see the modern concept of the fanboy. People who feel so attached to their camera brand that they have decided to bear its banner and fight for it in an endless virtual war about who is the best. As much as one can criticise the mechanisms of the modern photography market, it is still fast moving. That is quite an achievement for an oversaturated market that is threatened by the most dramatic technological development in the consumer world since the introduction of the internet itself. The smartphone might have taken its toll on the core consumers, but thanks to social media, the same technology is also fuelling the whole photography industry. The biggest difference between the camera manufacturers turning to mirrorless body designs compared to market changes in the past is closely connected to the way how we consume information. Looking back at industry milestones like the switch from analog to digital or the introduction of full frame sensors, it seems clear that those advancements have been far more extensive. At the same time, the internet hasn’t been anywhere near the state it is in today. Back in the days when people switched from 35mm film to digital there was no facebook, no youtube or even rumour sites. The main source of information for hobbyists and pros alike were photo magazines. I remember Canon introducing the first iteration of the Canon Eos 5D. That camera was a milestone. It was the first full frame DSLR in a Semi-Pro body, with a price tag even non-professionals could afford. It was far from perfect though. In fact there was a fault in the first few batches that were shipped. The glue used on the mirror inside the camera was of poor quality and started to dissolve over time. This resulted into a fair amount of Canon Eos 5D owners getting their DSLR turned into a mirrorless camera long before the term was introduced. Can you imagine the shitstorm this would have caused nowadays? Back then people were certainly annoyed, but Canons customer service was able to handle the whole matter quickly and quietly. Today that wouldn’t be possible and you can bet, that the who influencer crowd would be fuming about Canons poor quality control. While the transition to mirrorless is certainly not as big of a deal as the industries switch from analog film to digital cameras, one could argue about the transition from crop sensors to full frame compared to the transition from traditional DSLR designs to mirrorless bodies. Personally I think that mirrorless cameras do have a fair amount of advantages over DSLRs, but I don’t think DSLRs will disappear soon. Smaller companies like Fujifilm, Olympus or even Panasonic might have been more agile in transitioning into the mirrorless world, but they had little to none existing DSLR lines that would hold them back. Sony is a bit of an exception in my eyes. They started their camera business by buying Minolta and have not only overcome great hurdles but also invested quite heavily into research and development. They are the brand with the most sophisticated mainstream mirrorless camera system out there and that is not going to change anytime soon. If you look at Canon and Nikons new full frame mirrorless systems, you won’t find much that existing mirrorless models already offer. While Canon’s approach can be seen as a mirrorless Canon Eos 5D Mark IV, Nikon’s approach is a bit more broader. While the Nikon Z6 is positioned as an entry level full frame body, the Nikon Z7 is closer to the Nikon D850. All three models don’t don’t seem to care much about the current mirrorless philosophy of having smaller and lighter bodies. Both camera manufacturers treat their new mirrorless lines very much like their current DSLR offerings: Robust and very ergonomic. Where Canon and Nikon have always shined is the sheer size of their lens offerings. Canon EF and Nikon F mount lenses got you sorted for any field of photography. With the introduction of their new mirrorless cameras, things aren’t about to change – at least not for now. Nikon has introduced the Nikon Z mount, while Canons new mirrorless mount is called R mount. It seems to be no coincidence, that both companies marketing seems to be focussed on those new lens mounts. Thats where they see their strengths and that’s where most customers looking for a camera upgrade will look at first. Changing camera system is a huge pain. Selling existing cameras and lenses costs time and won’t bring you back anywhere close to the amount of money you’ve originally spent for your equipment. Thanks to native adapters, both camera companies offer an easy solution to use their existing lens collections. Sure, lens adapters are never ideal, but native adapters should be nowhere near the annoyance levels of third party smart lens adapters bring with them. Instead of raising the bar with their new mirrorless bodies, both Canon and Nikon have focussed on creating outstanding lenses for their new mounts to get the markets attention. While Canon has introduced a 28-70mm f2 zoom lens, Nikon is developing the Nikon “Noct” 58mm f0.95. Both lenses are crazy fast, but come with heavy price tags. Again, neither Canon nor Nikon seem to care about the dominant philosophy of cutting weight down. Both lenses will be pretty heavy and bulky, but will shift whats possible. There is no doubt, that those lenses will only be bought by a very small minority of customers. In the end not too many photography enthusiasts will be willing to spend a couple of thousand pounds for a lens that offers an f-stop more light. That doesn’t mean they won’t act as system sellers, though. What they show is that Canon and Nikon are still going strong in their core areas. Not many photographers will end up with a Noct 58mm f0.95 lens in their camera bag, but they will know that that’s what’s possible with their new mirrorless camera system. While Canon and Nikon entering the full frame mirrorless market grabbed a lot of attention, there was another big announcement at Photokina. Leica, Panasonic and Sigma will be forming the so called L-mount alliance. They will develop cameras and lenses which will use Leicas existing SL mount. While all three camera manufacturers have their own niche, their share of the camera market as a whole is pretty small. By forming the L-mount alliance their lineups can complement each others. Leica is probably the camera company that could lose the most in this constellation, as their high-end, top quality approach makes them vulnerable against other manufacturers that offer comparable quality with a much smaller price tag in the same system. Then again, the L-mount lineup won’t become their core product anytime soon. Leicas most important real estate are the M-series rangefinder cameras. For Sigma, the L-mount brings the opportunity to further develop their foveon sensor based DSLRs as a mirrorless line. While their foveon based DSLRs always offered superior colours and image quality in low iso ranges, they were basically unusable in ISO ranges higher than ISO400. With Leica and Panasonic offering CMOS based mirrorless cameras with the same L-mount, photographers will be able to pack a foveon powered Sigma camera together with a more balanced CMOS based mirrorless camera in their bags – effectively profiting from the best of both worlds. Panasonic will bring in their expertise in video. The new Panasonic S1 and S1R full frame mirrorless cameras seem to go the same way Nikon goes with the Nikon Z6 and Nikon Z7. Entry level full frame mirrorless model in form of the S1 and the S1R will be the high end, high Megapixel model. Not too much is known about the cameras at this point, but it would be a suprise if they weren’t focussed on videographers. With Panasonic focussing on video capabilities and Sigma as one of the biggest third party lens manufacturers on board, the l-mount could become the most versatile platform in the photographic industry. It all depends on how the three camera manufacturers play out their individual strengths. Looking at how much is at stake for the two biggest camera manufacturers, Fuji has been somewhat of a surprise of this years Photokina. Not only have they delivered a APS-C sized mirrorless camera that closed the gaps that its predecessor left. The Fujifilm X-T3 is also grossly underpriced. Looking at the pure image quality and performance of the camera, the 1300 pounds that Fuji asks for it, seem to be well invested. If that is enough to convert a consumer base obsessed with full frame format sensor needs to be seen. While Fujifilms X-Series has always been a popular choice, their philosophy of not entering the full frame mirrorless market has been discussed a lot in the past. Instead of creating a clear upgrade path for their customers, they stayed in their comfortable niche market. That all changed with the introduction of their medium format mirrorless camera Fujifilm GFX50S. While being a lot more affordable than classic medium format systems, “affordable” and “medium format” are still two different types of words. With the introduction of their rangefinder style Fujifilm GFX50R camera Fujifilm is trying to lower the price point once more. Priced at around 4000 Pounds and supplemented by heavy rebates in combination with selected GF lenses, the entry price for Fujifilms mirrorless medium format system should be around 5000 Pounds – That’s pretty close to the kit offerings of Canon’s and Nikon’s new full frame mirrorless cameras! With the development announcement of the Fujifilm GFX100S, there’s also an even bigger and higher performing predecessor on the horizon. Offering a whooping 100 Megapixels, IBIS and decent video capabilities, this camera will surely create a lot of attention on the market. Fujifilm seems to do a lot of things right at the moment. If they are able to generate enough new customers with those new type of medium format cameras, then the mirrorless medium format is here to stay. Sure, after dominating the mirrorless market with their new Sony A7III and Sony A7rIII models, Sony was in a comfortable position with Photokina to go down. Some people were hoping for a Sony A7sIII announcement, but that seems to be happening in 2019. More interesting in my opinion is, that they didn’t announce any new APS-C sized mirrorless camera. Sony seems to be willing to leave that market to the other camera manufacturers while concentrating all available resources on their full frame mirrorless offerings. Olympus on the other hand, couldn’t offer their customer base anything new and exiting. With Panasonic joining the L-mount alliance, Olympus seems to be the only remaining camera manufacturer that focusses solely on a mft system. They do have a loyal customer base and their PEN cameras basically started the transition from DSLRs to mirrorless systems. If the mft system will have any future will now largely depend on Olympus and their future plans. Don’t expect them to jump on the L-mount ship. They seem to be rather happy were they are. While things have moved fast in the photo industry over the last couple of months, that so called mirrorless war hasn’t even started. Like with the technological advancements in the past. The transition from DSLRs to mirrorless systems is a slow moving revolution. The market entry of the two biggest camera manufacturers might mark a historic break, but they are not yet willing to go all in. DSLRs and mirrorless cameras will coexist for quite a while. The good news from a consumers point of view is, that sheer amount of different systems and solutions have never been bigger. Although sales are going down, the camera manufacturers seem more than willing to push camera technology to new heights. While Smartphone cameras are closing the gaps on the lower end, they are nowhere near the quality of professional camera systems. This was my first article published on this weblog. Thank you for taking the time to read it. I hope you enjoyed it. Of course, there are a lot more developments in the photographic industry and this article doesn’t aim to provide a complete overview of the current market. These are simply the important points that I see. Feel free to leave a comment. I do appreciate it.